This photo is one of many that were taken of me and/or my dolls during the time I worked at the Community Press. This photo was one that was taken for a story about paying for vacation, hence the piggy bank. 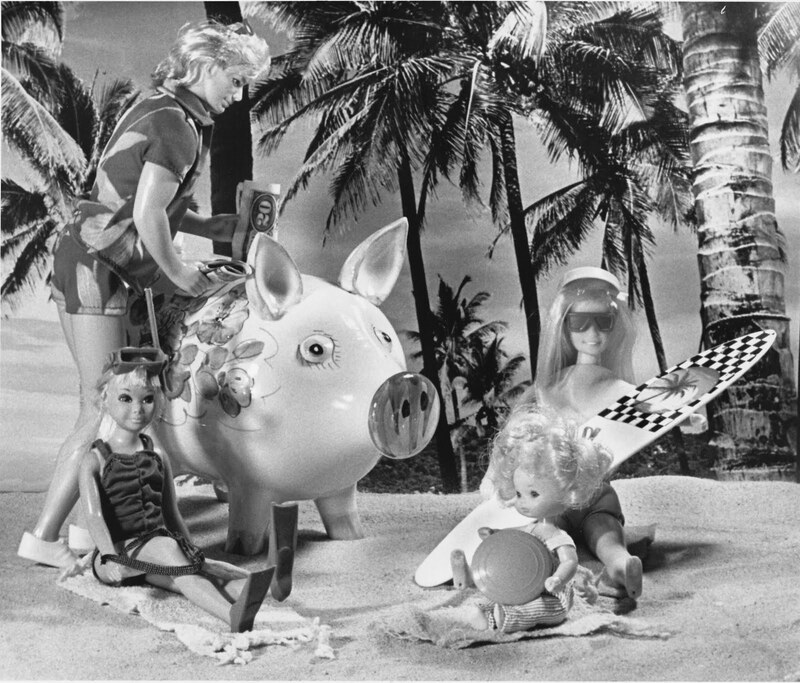 In the photo are Rocker Ken in 1983 Hawaiian Ken's trunks, Equestrienne Barbie in Malibu Barbie's swimsuit, Malibu Skipper in a late 70s swimsuit, and Megan. The photographer was named Lisa, but I cannot remember her last name. I also obtained some details from the book Collectible Barbie Dolls 1977-1979 by Sibyl St. John DeWein, copyright 1980. 1045 Bath Chest and Commode, pink (shown in 3560, 4530 and G-1). 1049 Luxury Bathtub, pink (shown in 3560, 4530, G-1 and T-39). This comes with a yellow terry wrap, one of the few Dream House items that came with clothing. 2150 Bedroom set sold only in Europe. 2152 Dining Room set sold only in Europe, orange, yellow and white, table, four chairs, oven, serving cart. 2417 Stove and Microwave Oven, orange and yellow (shown in 3560). Pink and white (shown in 4530, G-1 and T-39). 2467 Desk and Seat, green (shown in 3560). 2468 Chair and End Table, pink and green (shown in 3560). 2469 Vanity and Seat, pink (shown in 3560, 4530, G-1 and T-39). Stock number 2155 in Europe, orange, yellow and white. 2470 Dining Buffet and China Cabinet, blue (shown in 3560 and T-39). Pink (shown in 4530 and G-1). 2471 Armoire, pink (shown in 3560, 4530 and G-1). Stock number 2153 in Europe, orange and white. 2472 Bed, Nightstand and Rug, pink (shown in 3560). Does not come with a rug in 1983 (shown in 4530, G-1 and T-39). Stock number 2154 in Europe. 2473 Refrigerator and Freezer, yellow (shown in 3560). White (shown in 4530, G-1 and T-39). 2474 Sofa and Coffee Table, pink and green (shown in 3560). Pink (shown in 4530 and G-1). Stock number 2156 in Europe. 2475 Dining Table and Chairs, blue, four chairs (shown in 3560). Pink (shown in 4530 and T-39). 2587 Dream House, orange and yellow and white, furnished (shown in 3560 and 4530). Pink (shown in G1). 2588 Dream House, orange and yellow and white, unfurnished (shown in 3560 and 4530). Pink (shown in G1). 3760 Living Room Finishing Touches, red, includes rug and pillows (shown in 3560). 3770 Kitchen Finishing Touches, orange and yellow, (shown in 3560). This includes a rug, tablecloth and apron. The tablecloth is made of the same cloth as Barbie’s Kmart Fashion Classic 2876 and Hot Locks 3837 Satin Pantsuit shirt variation. 4331 Entertainment Center, pink, sofa, easy chair, coffee table and end table (shown in 4530 and G-1). Stock number 2151 in Europe, orange, yellow and white. 4337 Dining Center, pink and white, comes with table and two chairs, stove and microwave oven (shown in 4530 and G-1). 4345 Bath and Beauty Center, pink, bathtub, vanity and stool (shown in 4530 and G-1). 5641 Dream Bed, pink, canopy bed (shown in 4530, G-1 and T-39). Called Dream Glow Bed (it glows in the dark) in the 1986 clothing booklet. 7402 Fashion Sofa Bed and Coffee Table, white wicker love seat and table (shown in G-1 and T-39). 7403 Fashion Chair/Lounger and End Table, white wicker chaise longue--yes, this is the correct spelling--with blue and pink accessories (shown in G-1 and T-39). 7404 Fashion Living Room Set, white wicker furniture with blue and pink accessories (shown in G-1). 7797 Beauty Center, pink, dresser closet combo (shown in T-39). 9947 TV and Video Center, white and pink, with TV stand, TV and VCR (shown in T-39). 4432 Dream Cottage, orange and yellow and white, unfurnished (shown in 4530). 4718 Dream Cottage, orange and yellow and white, furnished (shown in 4530). 1478 Barbecue, orange (shown in 3560, 4530 and G-1). I have this and the hamburgers, hot dogs and utensils are very realistic-looking! 1479 Patio Table and Chairs, pink (shown in 3560). Blue and white (shown in 4530). Pink and blue and white (shown in G-1). 1480 Patio Recliner and Serving Cart, orange (shown in 3560, 4530 and G-1). 1481 Pool, yellow and white, unfurnished (shown in 3560). 1496 Pool with patio furniture, yellow and white and pink (shown in 3560 and 4530).